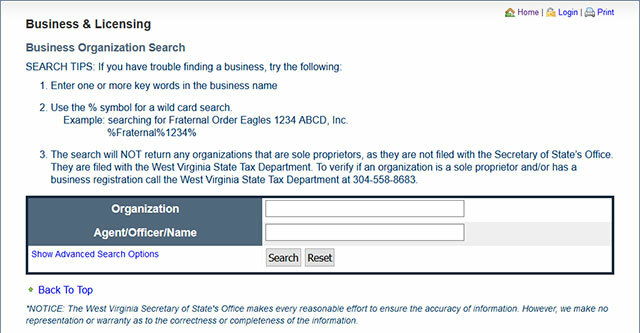 Any registered corporate or business entity in the state, like corporations, Limited Liability Companies, Limited Partnerships, Limited Liability Partnerships or Limited Companies, each and every record regarding the same is included in the business registry of the West Virginia Secretary of State. The business and corporate division takes care of the same and details regarding filing and authorization and licenses can be found in the business registry itself. 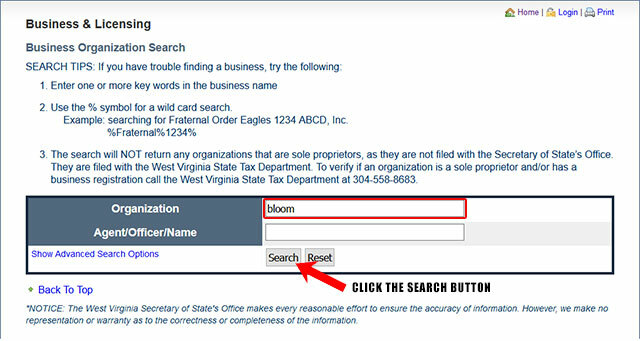 Below is a step by step guidelines on how to use the West Virginia business search tool. 1. The first step is to access the West Virginia business search page by clicking here. The search page will look similar to the screenshot below. 2. This business search form allows you to search by organization name or by agent/officer/name. For this example we will search by organization. Go ahead and type "Bloom" in hte "Organization" field and then click the "Search" button as shown in the screenshot below. 3. Once you click the "Search" button the system will then display a list of results that match your search criteria. It will show the organization name, type, effective date, established date etc as shown in the screenshot below. 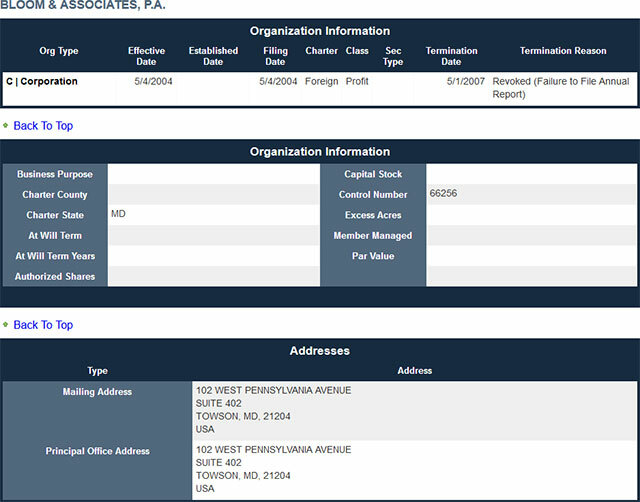 To view the details of a business, click the organization name. 4. When you click the name of the business you want to see the details for, it will take you to a page that shows that business entities name, type, filing date, class, address, agents etc as seen in the screenshot below. 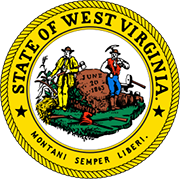 The Secretary of State of West Virginia is an elected government office in the US state of West Virginia. In terms of fiscal, physical and the number of staff, the office is quite small and yet plays a major role in the public affairs of the state. The current Secretary of State of West Virginia Natalie Tennant who took office in March 2009. The duties of the West Virginia Secretary of State are broadly divided. Among the major functions, the election and voter registration duties take the topmost position. Other duties include those in the business and licensing division, notaries, public archives and sports department of the state.